Over the past 30 years, researchers and professionals in a variety of human services and animal welfare disciplines have established significant correlations between animal abuse, child abuse and neglect, domestic violence, elder abuse and other forms of violence. Mistreating animals is no longer seen as an isolated incident that can be ignored: it is often an indicator or predictor of crime and a “red flag” warning sign that other family members in the household may not be safe. Combating animal cruelty in your jurisdiction not only makes your community safer for animal victims, but for humans as well. 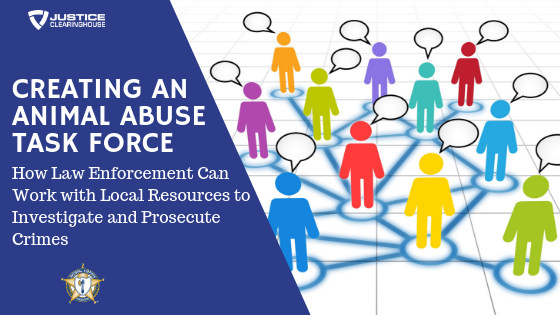 Creating a task force in your jurisdiction involving police, prosecutors, veterinarians and other animal welfare professionals can help streamline animal abuse cases, resulting in more successful outcomes.